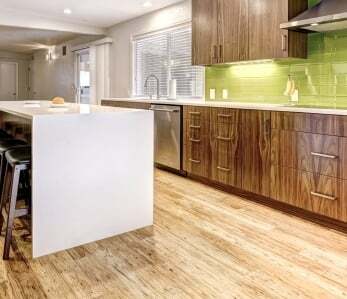 Home › Flooring › Why Not Have a Bamboo Themed Kitchen? Why Not Have a Bamboo Themed Kitchen? 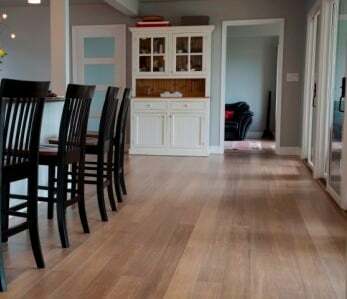 If you’ve been reading our blog, you’ve no doubt heard us mention once or twice (or, okay, countless times) why bamboo is such a great flooring option. For starters, it’s uniquely beautiful. Since it’s made from a grass instead of wood, bamboo offers a very special look to your home. It’s sleek, elegant, warm and fun! Bamboo also happens to be extremely durable, and who doesn’t want durable floors? It can hold up against scrapes, scratches, dings and dents just as well as hardwood floors. In fact, strand woven bamboo has a Janka rating twice that of even oak floors. Now that’s durable. Bamboo is also the most eco-friendly flooring option on the market today. That’s because as a grass, bamboo can regenerate in as little as five years. Compare that to most hardwoods which can take 30 or more years to regenerate. And finally, bamboo is very affordable, and in these hard economic times, affordability is usually priority numero uno to most home owners. 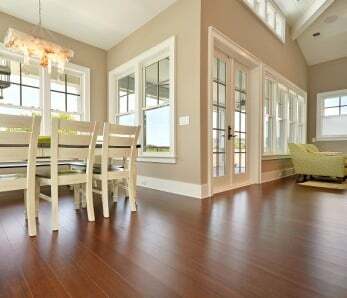 Quality bamboo flooring can be purchased for as little as $3 per square foot. 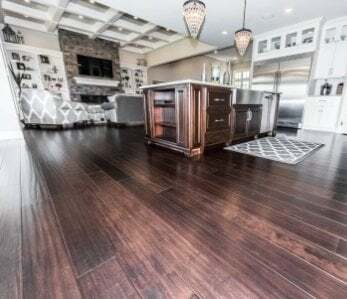 Compare that to many hardwood floors which can cost between $5 and $8 per square foot, and you can see how the savings can really add up. Taking into account the benefits we’ve just mentioned, you can see why bamboo would be a terrific choice for your kitchen’s floors. 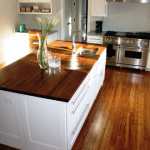 But did you also know bamboo is a great option for kitchen counters and cabinets as well? Bamboo counters are somewhat of an undiscovered gem, and it’s not the first material most homeowners think of when shopping for countertops. But bamboo is extremely versatile, functional and attractive. It’s a material that looks great when used in combination with stone and other materials commonly found in kitchen décor. 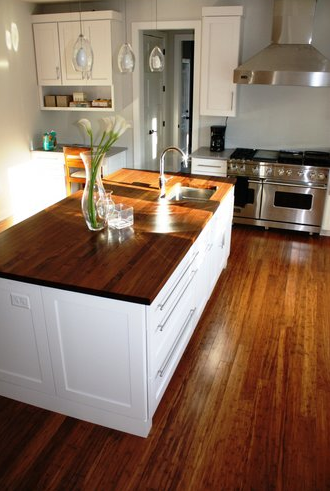 Bamboo is also a great countertop option because it is more easily repaired than say tile and granite. If you happen to scratch it, simply sand and reseal it. Try doing that with expensive granite countertops – not gonna happen. Bamboo is also bacteria resistant as well as resistant to mildew, two things commonly lurking in kitchens. In much the same way as traditional hardwood countertops, bamboo comes in a variety of grain orientations such as horizontal, vertical and end grain which gives you the look of butcher block counters. There is also strand woven bamboo, which I mentioned earlier, that resembles a standard timber look. Bamboo cabinets? Yep, bamboo cabinets. Bamboo has been, traditionally, a material only contractors could get their hands on, but nowadays, manufacturers offer custom bamboo cabinets as well as “ready to assemble” or RTA kitchen cabinets that can be put together and installed quite easily by the homeowners (talk about cost-cutting!). These RTA cabinets open up a whole new array of decorating options for homeowners and the kits generally include easy-to-follow directions. Many modern decorators are in their client’s kitchens because bamboo offers a contemporary version of a very classic look. Bamboo is light and fresh but also retains an elegant look and feel traditionally associated with hardwoods. 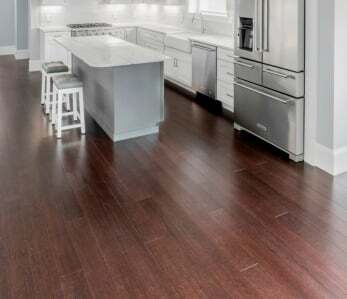 In this way you can reap the biggest benefits of hardwood floors, counters and cabinets, but with more eco-friendliness, a smaller price tag, and a unique look you will enjoy for years.